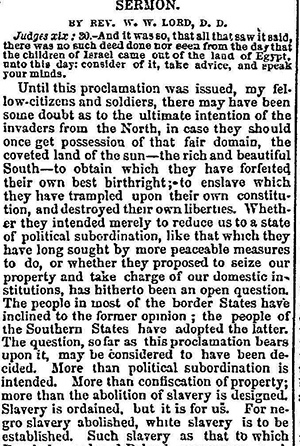 From Macon Daily Telegraph and Confederate, Oct. 20, 1864. From Peninsular News and Advertiser [Delaware], Dec. 6, 1861. The Revelation is remarkable in its imaginative ingenuity, but also in capturing the whole spectrum of an “Old Testamentism” that characterized antebellum America: the political interpretation of the Jewish republic as a model for American federalism; the numerous renditions of American history as an event in a biblical chronicle written in biblical English; the persistent speculations on the Hebraic origin of the American Indians, among other manifestations—all appeared in some manner in the Revelation. Beyond these particular strands, the piece manifested the fascination with biblical authenticity that characterized much of American Old Testamentism: the conflation of North America with the biblical Canaan and the United States with Israel (the New Revelation significantly avoided the typological adjectives “second” or “new” to describe America’s relation to Israel) was complete and unconditional. It is revealing to read the piece, particularly its utopian ending, while keeping in mind the abject condition of the Confederacy in its final months and the existential anxieties contemporaries confronted during that testing time; the Old Testament biblicism could apparently express not only chauvinistic self-assuredness but also national diffidence. From Weekly Wisconsin Patriot, Mar. 15, 1862. From Macon Daily Telegraph, Sep. 18, 1862. The New Revelation demonstrates, nevertheless, that while the Old Testamentism I explored in American Zion may have receded in the decades leading up to the Civil War, it did not vanish. The heightened religiosity and millennialism associated with the war years indeed stemmed the decline in the disposition to make use of Old Testament metaphors and images. Even in wartime slaveholding Delaware, advocates of the Union could still describe their “government [as] the modern Israel of God, in its national capacity,” while southerners and their sympathizers in the north would see Abraham Lincoln as an American Rehoboam who split the Union and Jefferson Davis a Jeroboam leading a justified secession. In the same vein, northerners equated the southern secession to biblical rebellions, notably to Absalom’s disastrous revolt against his father David, while southerners drew comfort in seeing themselves as the outnumbered kingdom of Judah led by Abijah and Asa, fighting the mightier and errant kingdom of Israel. More generally speaking, the older forms and structures of the references to the United States and the Second Israel resurfaced remarkably during the years of struggle, apparently in order to ensure Americans that God had not abandoned them. 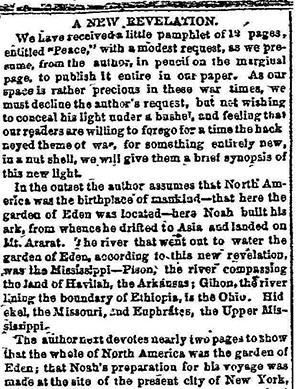 Nevertheless, this wartime flourish ended after the demise of the Confederacy as American writers would less and less refer to their reunited nation as a latter day Israel. American prints and newspapers, once an endless source of Hebraic allegories, would reflect after 1865 the new and considerably secularized form of political speech. 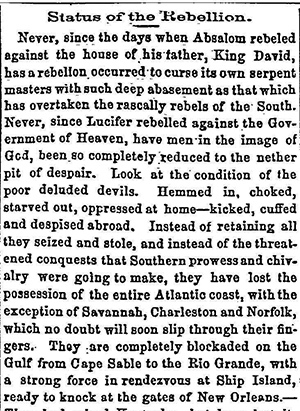 “A New Revelation,” Macon Daily Telegraph and Confederate, Oct. 20, 1864. 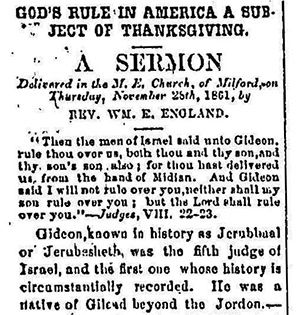 “God’s Rule in America a Subject of Thanksgiving,” Peninsular News and Advertiser [Delaware], Dec. 6, 1861: 1; “Jeroboam and Jeff. Davis,” The New York Herald, Jan. 31, 1861. “Status of the Rebellion,” Weekly Wisconsin Patriot, Mar. 15, 1862: 2; “Be Not Discouraged,” Macon Daily Telegraph, Feb. 13, 1862. For an impressive wartime restatement of the United States as the Second Israel see Phillips, The American Republic and Human Liberty Foreshadowed in Scripture.